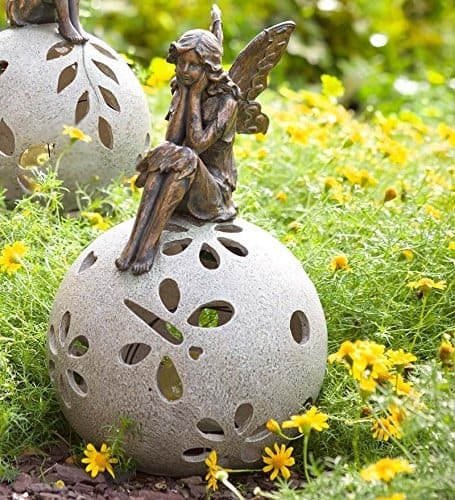 If you’re looking for some Fairy Garden Inspiration, look no further, we’ve gathered some of the cutest Fairy Ideas around and we have something for everyone. 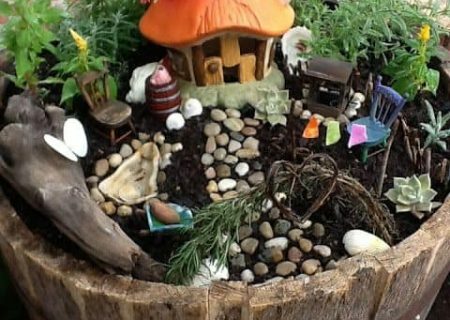 Invite the fairies into the bottom of your garden with these beautiful fairy garden projects that the entire family will love. We have put together a collection of our favorite ideas and we know you will love them as much as us! Scroll our page to the end for all the inspiration and be sure that you Pin your favorites. 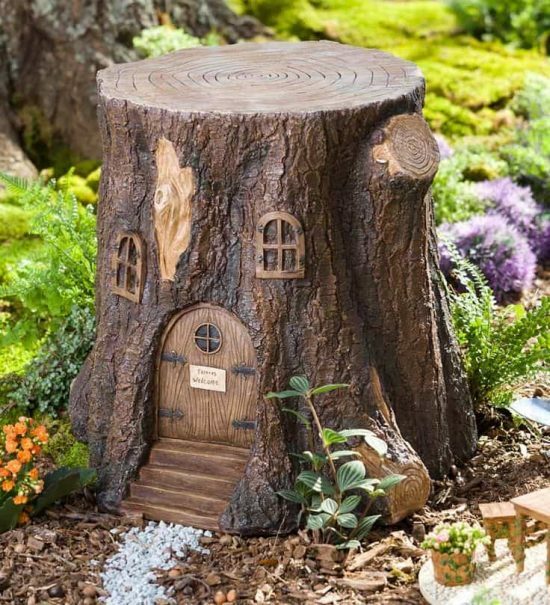 Wondering what to do with those old Tree Stumps in the garden? 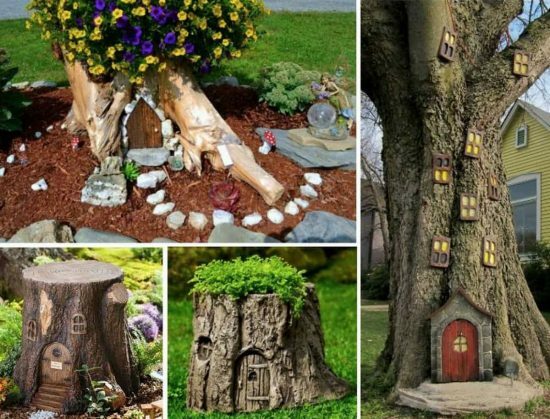 Turn them into a fabulous Fairy House, it will add a whimsical touch and makes the perfect centerpiece for your display. 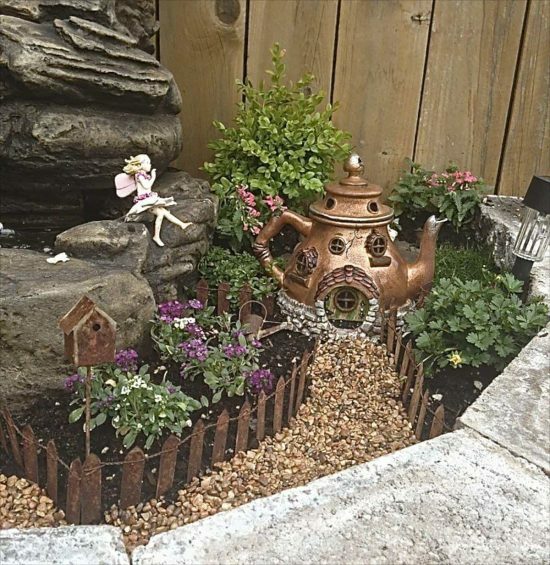 Why not incorporate a Teapot into your Fairy Garden Display. 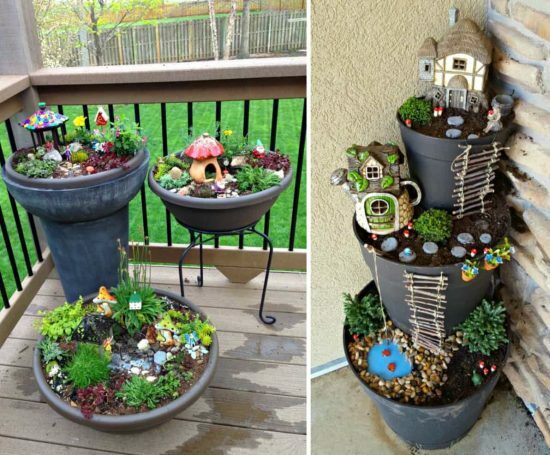 This is a wonderful idea and again, so easy. 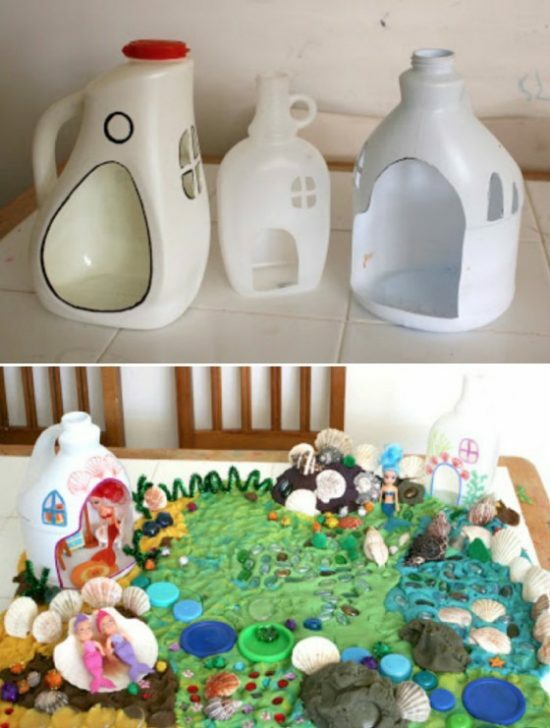 You can paint your Teapot in a metallic paint and glue on windows and a door. 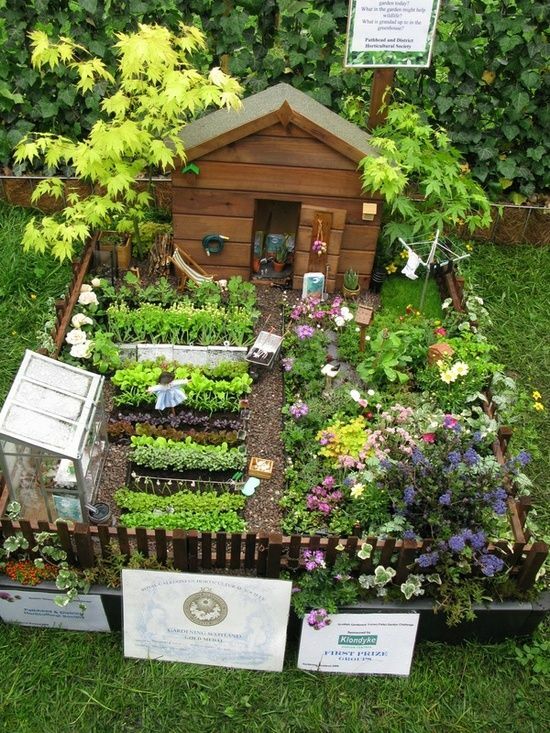 Here’s another sweet idea from Pinterest – Don’t you love the recreation of a herb garden in this version! 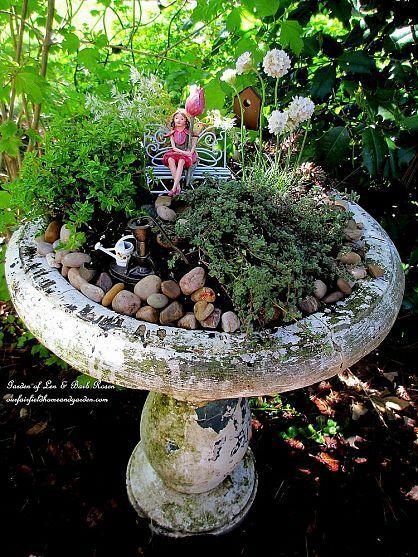 Everyone has an old bird bath lying around. 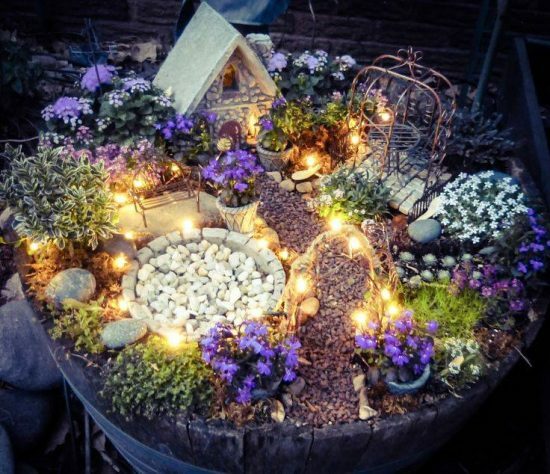 Why not upcycle yours in to this beatiful Fairy Garden. 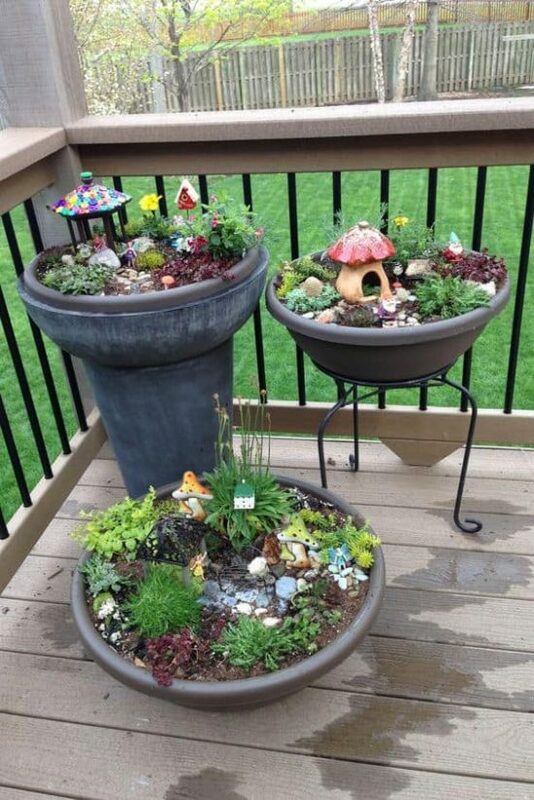 It is a great idea and the elevation means you can see all the elements clearly. 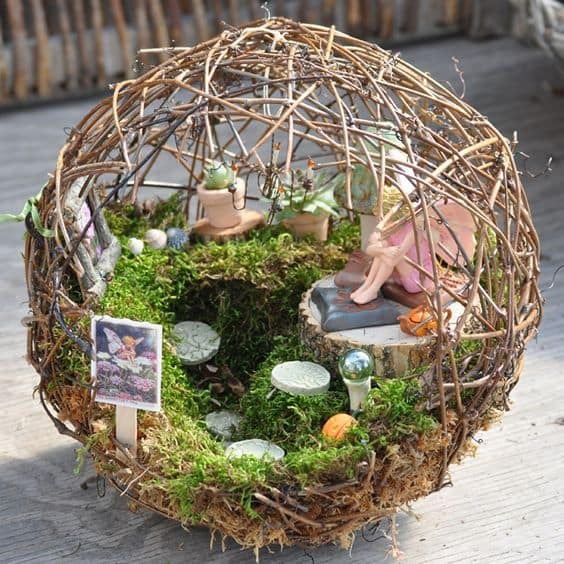 You can also use a sphere to create a Fairy Garden. Just open up a section and it’s like you’re looking inside. 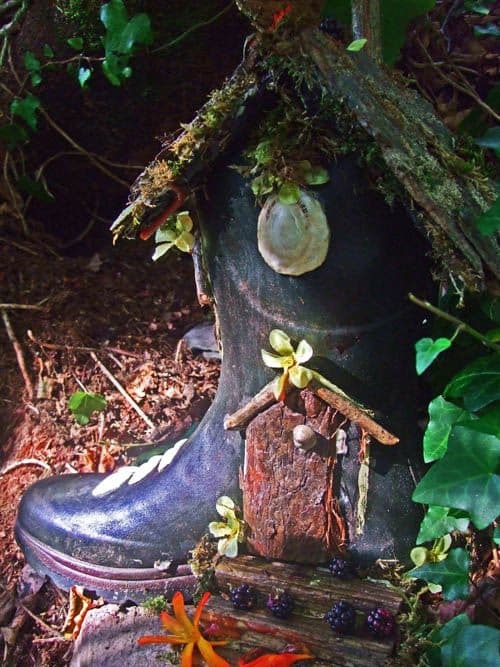 We love this Rubber Boot Fairy Garden What a great upcycle this is and the perfect use for that Wellington Boot no longer in use. 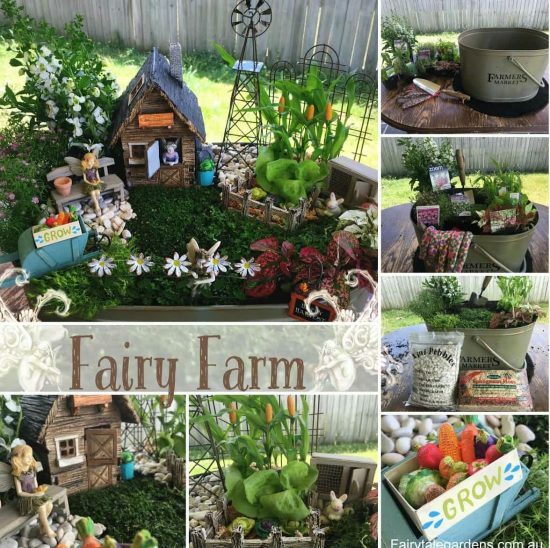 Why not pop your Fairy Garden in a box. 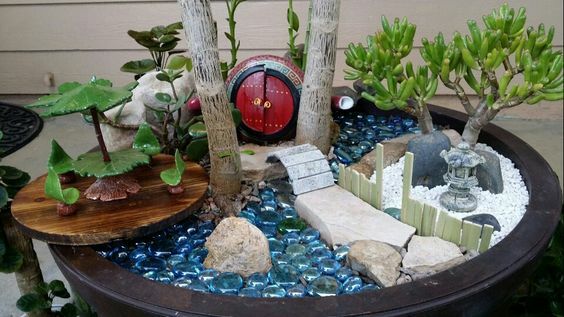 We love the featured idea above and the pebbles add a beautiful texture to your display. The grass brings it to life too! As you can see, anything goes. Have fun! 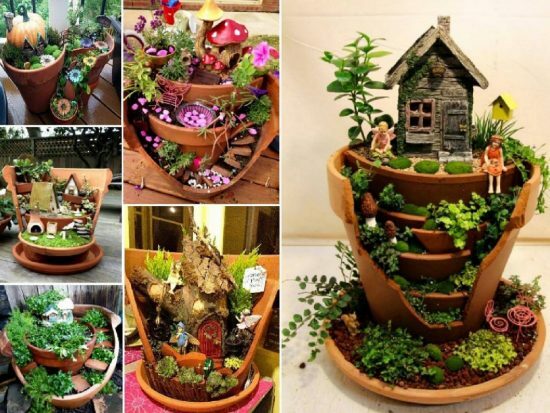 Here’s a very simple idea, we love this Stacked Fairy Garden that we found on Pinterest – All you need to do is start with a large clay pot base and then add smaller ones on top until you have a tiered effect. You can paint it any color you like and we love the twig ladder that runs up the side. 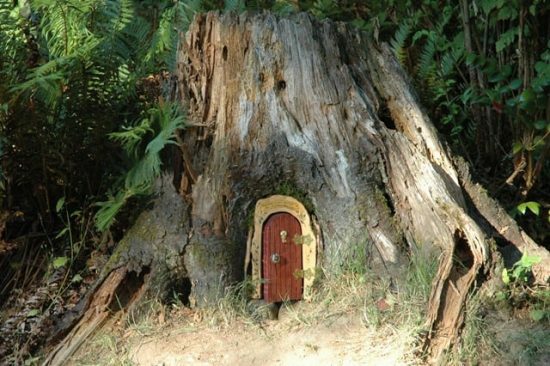 Fairies need help to get to the top! 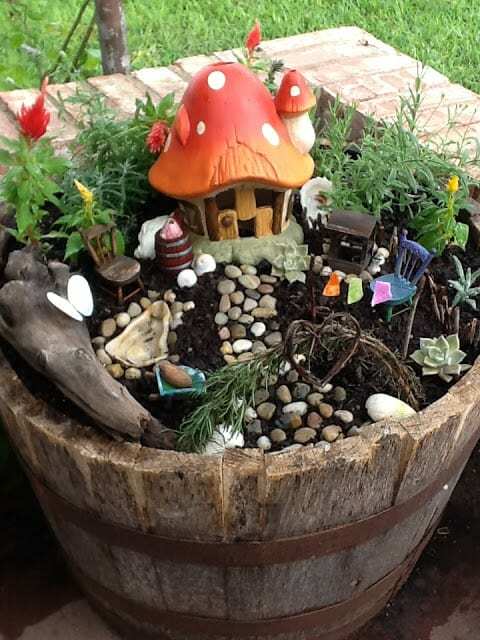 We found this wonderful Wine Barrel Fairy Garden on The Creamer Chronicles’ site. This is a stand out and it’s the perfect use for that abandoned barrel! 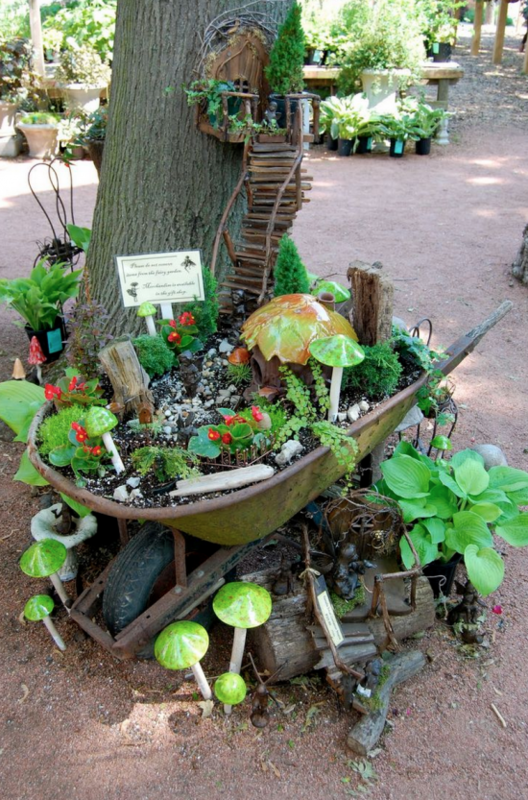 You could integrate this nicely into a garden bed amongst your plants. 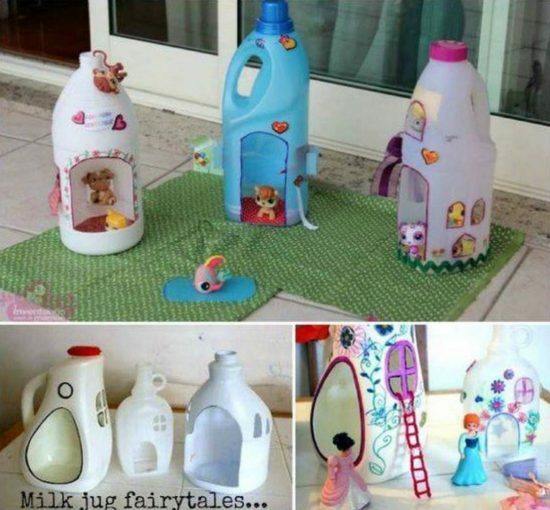 Here’s another very cute idea that is easy to recreate and is the perfect use for your Milk Jugs. As you can see from the Milk Jugs above, you can add all sorts of elements to them like cute little ladders. 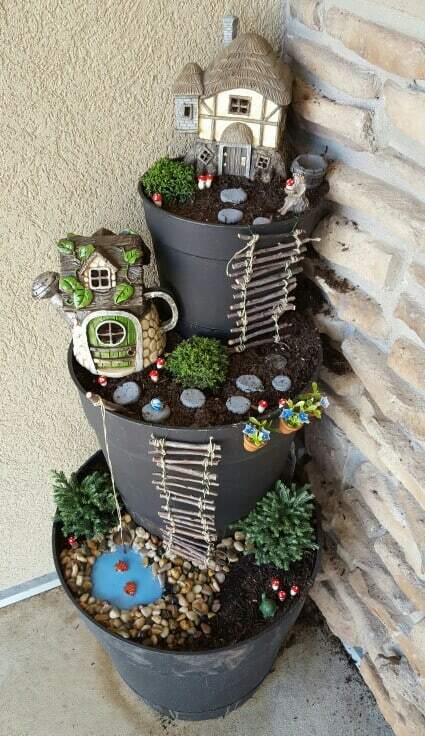 You can paint them, cut out windows and add some little dolls too.